I pulled quite a few books from my TBR stacks that have a winter theme or setting and saved them to read during the "bleak midwinter" as it were. Well, I live in a place that doesn't get snow and often feels more like summer during those winter months. Hardly bleak. I was hoping this would be one of our "cold" winters, but it has been consistently warm and sometimes quite hot. My seasonal expectations and reality just aren't in sync this year, so I've been living vicariously through my winter themed books. "In the winter, cold winds blow down from Siberia, pick up moisture over the Japan Sea, and drop it as snow when they strike the mountains of Japan. The west coast of the main island of Japan is probably for its latitude the snowiest region of the world. From December to April or May only the railroads are open, and the snow in the mountains is sometimes as much as fifteen feet deep." The setting and descriptive passages are often stunningly beautiful. It was this that kept me reading. The setting is cold and remote. The characters follow this pattern and this makes them unreachable and, ultimately, unlikeable. A cold and remote setting has a harsh beauty, but these same characteristics in people are unflattering. Nevertheless, it was this parallel between setting and characters that helped me overlook my dislike and focus on the writing to see the beauty of the whole. The story takes place at a hot-springs in the snow country. Shimamura is a wealthy idle man who travels to the hot springs without his wife. Komako is one of the hot-springs geisha, a near outcast. There is a sense of wasted and decaying beauty in Snow Country and this comes across in the repeated thoughts of Shimamura about wastedness and in Komako's own impulsive and self destructive behavior. An "indefinable air of loneliness" surrounds Komako, and Shimamura's life seems empty. Shimamura is fascinated with the reflected images of others in mirrors and windows and is drawn to illusion over reality. Again though, I'm pulled away from the characters themselves by the powerful images that the author creates. Images like that of the rounded snow covered mountain tops turned red by the rising or setting sun. This parallels Komako's white powdered neck curving to her rounded shoulders of red skin that flow and disappear into the wide neck of her kimono. Images of red and white recur throughout the novel and one could write an entire post on these images and metaphor. A deep vein of darkness and loneliness runs through Snow Country and this may not be to everyone's liking. Those who have an interest in Japanese literature, those who crave poetic writing, and those who love imagery or strongly visualize when they read will want to read this short novel by one of the masters of Japanese literature. The Sunday Salon is a weekly virtual get together where readers share thoughts about their reading. We write about books and reading on our own blogs and then visit and chat with other saloners through the comments feature. Meredith, Thank you for your kind words! 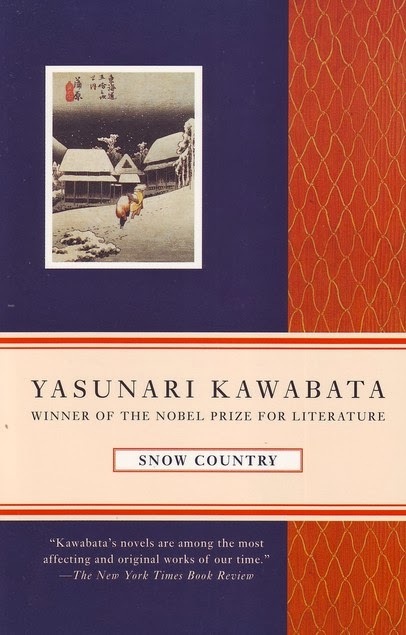 I just edited my post to include a link to the Japanese Literature Challenge. I'm a little rusty with all the posting details. I have this one waiting for me in my TBR. I'll look forward to your thoughts when you've read it! I've had this book on my wish list for ages, and am really intrigued by the parallel between setting and characters. I'll have to pick up a copy. Great review, Terri! I have never heard of this book before, but that's mostly because my library lacks for Japanese authors. I really need to buy some or inter-library loan. I've developed quite the fascination with Japanese literature. The mindset and cultural cues are so different from what I grew up with and I think this sense of other is what intrigues me. Do you ever watch older Japanese movies like The Blind Swordsman? Terri, I wanted to read this for Bellezza's event but eventually decided on a totally unsatisfying novel by another author instead. Love what you say about this work's poetic writing and imagery and will keep in mind your frustration with the characters when I finally get around to reading it for myself. Nice review! Thank you Richard! I am a big fan of imagery and metaphor. I thought there was a poetry to it even in translation, but I wish I could read this in the original language though since there was sometimes an awkwardness that might have been from the translation. Hi, I read this one too for JLC7. 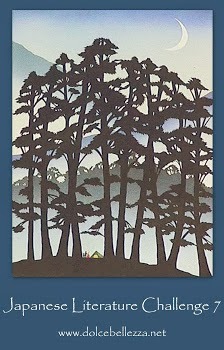 I enjoyed it, mostly for the descriptive images of the countryside. Your review is so much more elegant than mine.I enjoyed this one so much that I moved on the another by the same author - the Izu Dancer - same style, same clever descriptions of snow..... I've just posted my reviews for JLC7. Hi, I read this one too for JLC7 - and I enjoyed it thoroughly. I've just posted by reviews where I say I enjoyed this author so much, I read another of his - the Izu Dancer. So descriptive of the natural envronment and almost of third person view of the relationships and people. I still love this about Japanese authors. Thanks for your insight on the Snow Country also.